Canada’s 145th birthday is only a few days away and she doesn’t look a day over, errr… let’s just say she looks damn fine. 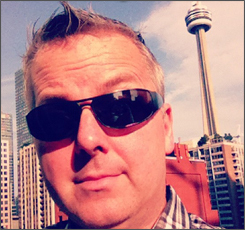 Labatt Blue is celebrating the holiday by giving Canadians a chance to win a Classic Canadian Summer Vacation. The contest is being promoted by a series of ads running in Metro newspapers across the country this week. The ads also serve as triggers for an augmented reality experience when scanned using the Mira AR app. The app brings four iconic Canadian landscapes (The Rockies, Prairies, Niagara Falls and Peggy’s Cove) to life, allowing users to tap around on their screen to launch their own mini Canada Day fireworks displays. 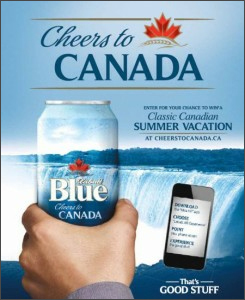 The Cheers to Canada campaign comes from Publicis Toronto, and the augmented reality experience was created by Halifax’s Ad-Dispatch. The Mira augmented reality app can be downloaded free at the iTunes or Android Play stores.